Details of the DuoDrive special prop system. The reason for choosing the Duodrive system is its unique way of delivering faster acceleration, improved top speeds (hello... It's a barge? ), better fuel consumption and reduced vibration. Their technology gives a method of creating a duel, counter-rotating output props from a single driven input. 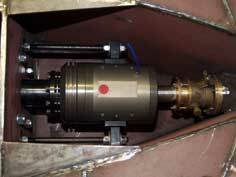 The Duodrive system brings significant efficiency improvements and counter-rotating propellers reduce energy waste. ... The two propellers are positioned immediately ahead of each other on the same shaft line (one shaft counter-rotating inside the other) and therefore rotating in opposite directions. The negative rotational energy imparted to the water by the forward of the two propellers is cancelled out by the opposite rotation of the larger rearward propeller. The slipstream from counter-rotating propellers is almost smooth and straight, with little twist. 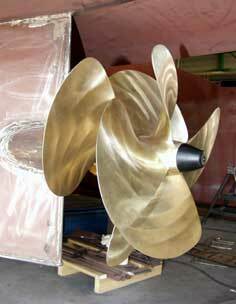 It is expected to be 15 to 40% more efficient than a standard single propeller set-up. The benefits are; significantly increased efficiencies through performance gains, reduced operating costs and environmental improvements. The props are smaller in diameter than the standard 28" size for this sized craft, a rather valuable extra for shallow inland waterways. It is a 7-blade solution; The forward 3 blade prop will be a LH propeller, 24" diameter x 19" pitch. The rearward 4 blade prop is a RH propeller, 26" diameter x 20" pitch. The odd number of blades will reduce vibration and loading on the rear cutlass bearing. Feb 2007 saw Graham Miller of DuoDrive went to the Ament Metaalbewerking fabrications factory in Kinrooi Belgium and commissioned his DuoDrive installation in JENAL. This was his first large ship installation so he really wanted to make sure all was in excellent working order. The left picture shows Graham working with Martie of Ament (standing on right side of Graham) and they are installing and additional item on the DuoDrive, cooling fins. The picture on the right shows the black cooling fins installed and ready to cope with any eventuality, Graham is the first to say that cooling wont be an issue on JENAL but he likes to be doubly sure -this comes from his Grand Prix engineering background. Hydrosta, the Dutch hydraulics people let the construction of JENAL down by inefficient specification for their original design, in particular the mounting of the hydraulic motor. They specified in solidly mounted unit while Graham, quite rightly specified his DuoDrive, flexibly mounted. The reason is to vastly reduce NVH (noise, vibration & harshness), the sort of sounds and fizzing sensations that can run through a hull that make cruising unpleasant. Graham Miller (unfortunately no longer in control of DD) came to the rescue by designing and making the flexible mountings you can see on the left and above right pictures . The above right hand picture shows the steady (support) bar across the blue hydraulic motor and the black flexible mounts between the blue motor and the grey steel plate welded in-between the barge swim sides. A challenging construction for Graham because the brief was minimal disruption (welding) to the hull at this late stage in the build cycle. Unfortunately neither Ament Metaalbewerking or the new Duodrive owner could align the DuoDrive and hydraulic motor correctly so 'A&J' had to pay specialists Hydrosta to correct the cockup. It was suggested we installed an earthing devise onto the prop-shaft in-case static electricity builds up or electrolysis develops and it needs to be grounded through the hull. Just another example of attention to detail.